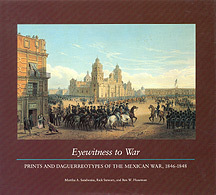 Prints and Daguerreotypes of the Mexican War, 1846-1848. Edited by Martha A. Sandweiss, Rick Stewart, and Ben W. Huseman. Smithsonian Institution Press, Blue Ridge Summit, 1989. 384 pp., 24 color and 180 b&w duotone illustrations,, 10x11". "In Eyewitness to War, the authors reveal how the public's desire to know and the new technology available created a revolution in communications; one that saw the rise of mass-circulation newspapers, illustrated memoirs, and a `wire service' using telegraph and steamship. The authors also explore the fledgling art of photography, review the early daguerreotypists who may have produced the photographs, and examine more than fifty daguerreotypes from the war. The prints, many in full color, are examined for historical accuracy as well as artistry." --the publisher.